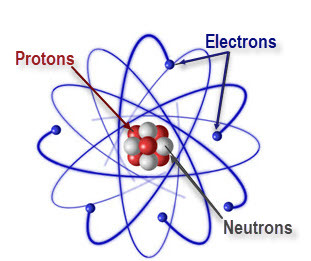 The basic structural components of a typical atom are electrons, protons, and neutrons. Protons and neutrons comprise the nucleus of an atom. Elements can be represented by chemical symbols. Compounds can be represented by chemical formulas. Each different element in the compound is represented by its unique symbol. The number of each type of element in the compound (other than 1) is represented by a small number (the subscript) to the right of the element symbol. Chemical equations can be used to model chemical changes, illustrating how elements become rearranged in a chemical reaction. 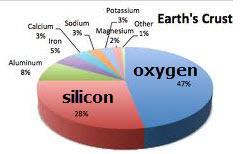 A limited number of elements, including silicon, aluminum, iron, sodium, calcium, potassium, magnesium, hydrogen, oxygen, nitrogen, and carbon, form the largest portion of Earth’s crust, living matter, the oceans, and the atmosphere.